ALL 5 STAR !!!!!!! The keycap is double injection PBT,nice typing expearence.Able to bind macros to 5 keys ,that is good for playing LOL gaming.Package is the best I have ever seen!LOVE IT ALL! 12 days. Good seller. Good product. I have to say that this keyboard is actually amazing.-Build Quality is amazing, The keycaps are double shot which means they will last a long time, switches are working as they should be,Switches are really close to Cherry MX switches so they give almost the same feeling when typing.Braided USB cable with some rerouting methods on the back of the keyboard helps with cable management. 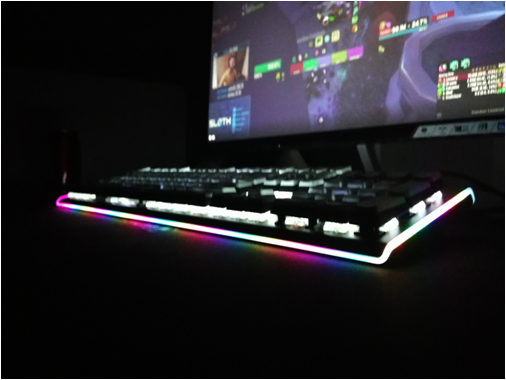 - You can use to customize the lighting of the keyboard. You can preset modes on the keyboard that you can use dont need a software this is really nice .